Can eating bugs save the world? Recently, the United Nations (U.N.) recommended that entomophagy could help with our world’s food insecurity issues. Entomophagy is the practice of eating insects, which was once a food source for thousands of years in many world regions. A report by the U.N. Food and Agricultural Organization has given recommendations for how insects can be used for both humans and livestock as nutritional and sustainable food choices. The guide includes over 1900 insects that are consumable. There are good reasons to believe that Insects should be a major source of food for the future. First, insects are healthy sources of nutrition, which makes them great alternatives to current major staples such as chicken, pork, beef, and even fish. For example, grasshoppers, one of the most popular edible insects, contain 20.6 grams of protein, 35 milligrams of Calcium, 5 milligrams of Iron, and numerous small amount of minerals and vitamins for each 100 grams. Compared to that, 100 grams of beef has only 27.4 grams of Protein, no Calcium, and 3.5 milligrams of Iron and some fat. Since more and more people are dying of unbalanced diets, with lots of fat and protein, insects provide a better diet for people. Insects are also an environmentally-friendly source of food. In its production, insects emit considerably fewer greenhouse gases (especially methane) and toxins (such as ammonia) than most livestock. Also, its production does not necessarily require lots of land just as the traditional livestock farms, so more land can be saved for nature. Since they are cold-blooded, insects are extremely efficient in converting feed into protein as well. 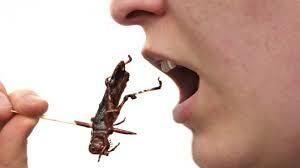 For example, Crickets need 12 times less feed than cattle to produce the same amount of protein. Lastly, they can be fed on organic waste streams, which not only reduces land and water pollution, but also produce quality food! Entomophagy has become a recent food trend. Currently it is estimated that 2 billion people use insects as part of their current diet. This includes areas like Oaxaca, Mexico, some Asian countries like Japan, and areas in southern Africa. Most western nations have until now shunned the idea of eating yellow jacket wasp larvae, but things may be changing. In the United States, enterprising companies have introduced new foods made from insects. One of these new products is cricket flour. Startup company, Bitty has brought to market cricket flour which is dry roasted pulverized crickets combined with gluten- free starch. Bitty sells the flour for baking and has added a line of cookies. Similarly, cricket flour is being used to make Exo protein bars. Exo protein bars raise crickets for human consumption which are fed organic grains to create a healthier protein bar. For those who are more adventurous, there are food carts like Don Bugito Prehispanic Snackshop in San Francisco who serve Wax Moth Larvae Tacos and Spicy Superworms. Recently in London and New York, restaurants have added insect plated including tasty dishes like “Grasswhoppers.” If this trend continues insect menus will soon be more prolific. The benefits of eating insects are plentiful, but our cultural norms have not yet caught up to entomophagy. The fatty acid pattern of house fly pupae has been found comparable to fish oils, but it will be a long time before we find Diptera oils being sold on the market. Despite our cultural sensitivities, the nutritional and environmental science bodes well with considering entomophagy as part of a healthy diet. It will take many more early adopters and entrepreneurs to create any significant change to our current diet, but it is a personal challenge worth considering for the sake of our planet. Tell us what you think. Would you try?